I have a love of wild foods. I can’t help it – wild foods satisfy three base yearnings: my need for real food, my love of adventure and my ridiculously frugal streak. Where others see inherent danger and inevitable bug bites, I see a day under the sun, isolated by the wilds and blessed by free food. In late summer the mountains are alive with wild foods. After the rain storms of late summer, we hike through the low-lying hills and the forested floors searching for edible mushrooms: boletes, chanterelles, oysters which find their way to pots of mushroom stew and golden logs of wild mushroom butter. The wild raspberries and tiny alpine strawberries grow in abundance too, and we pick them – with well-intentioned plans for wild berry sorbets and honey-sweetened jams, but they never seem to make it past the basket and are gobbled up in an instant. 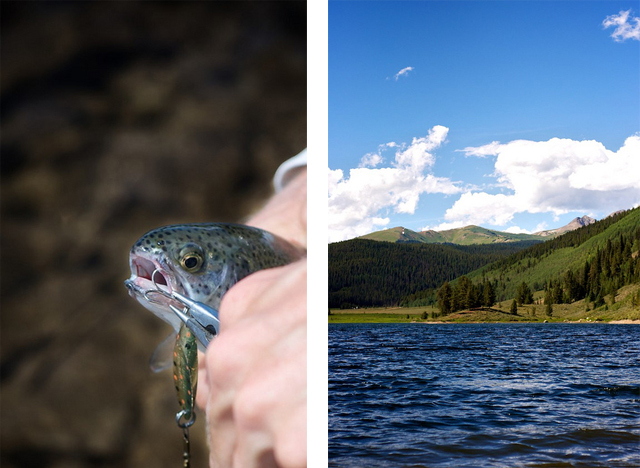 But when we can, which is not too often, we find our way to a high alpine lake and cast our lines in hope of catching a few fish. It’s a pleasure, the isolation and solitude for near the lakes and creeks nestled between the peaks, we’re completely alone – out of touch with the world. There’s no cell coverage, no wi-fi, no facebook, no twitter. Nothing. So we rode up along the creekside, and near an isolated reservoir where we spent the afternoon beneath the sun, and caught a few small trout which were easily gutted, cleaned, fileted pan-fried with another treat of the summer: wild-crafted chanterelle mushrooms, with bits of the forest flour still clinging to their ridges. First the trout are seasoned simply: with unrefined sea salt and ground black pepper, then fried in clarified butter. I purchase mine online, from grass-fed dairies (see sources) which is extraordinarily rich in conjugated linoleic acid – a nourishing fat that helps your body to better absorb fat-soluble vitamins. Trout, also, are a deeply nourishing food that, like salmon, is rich in B vitamins, phosphorus and omega-3 fatty acids. 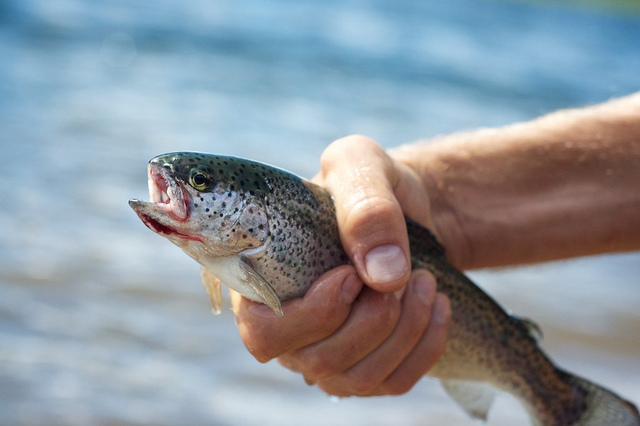 Sustainably farm-raised trout or wild-caught trout from clear and clean lakes and reservoirs make an excellent, affordable source of these essential nutrients. Pan-fried Trout with Chanterelles. trout ... Stir in sliced chanterelles and fry three to five minutes or until softened slightly. Melt one tablespoon clarified butter in a skillet over medium heat. As the clarified butter melts, season the trout filets with one-half teaspoon unrefined sea salt and one teaspoon ground black pepper. Places the trout skin-side down in the melted butter and cook, covered, for about eight minutes or until the fish flakes easily when pierced by a fork. Keep warm while you prepare the chanterelles. Melt remaining tablespoon clarified butter in a separate skillet over medium heat. Stir in minced shallot and fry until fragrant and translucent, about two minutes. Stir in sliced chanterelles and fry three to five minutes or until softened slightly. Pour in heavy cream and cook, stirring constantly, until the cream is thick and glossy – about two minutes. Stir in parsley and serve over trout. Any chance of a few pictures on the best way to fillet a trout? We are flyfisherpersons. We buy wild trout often. I tried your recipe with the following additions. I sauted 1 shallort, 1/2 pound fo white mushrooms, 3 anchovy fillets, whole cream and a sonoma valley chardoney (oaky). MMMMM. Marvellous. I will make this again with regional mushrooms when there is wild trout available.